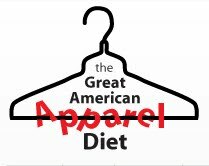 And here’s one I really can’t handle: The Great American Apparel Diet. The women who put together this blog have vowed not to buy any new clothes (excluding things like underwear) for a year. I’ll be curious to see how this turns out. >Ten years ago, while editing a magazine for a major healthcare system, I asked several doctors which they would prefer their patients do, watch their diets or focus on exercise. Mike Howard at the excellent Diet Blog reports on a study that compared people on diets with people on exercise programs, measuring not just weight loss but body fat percentage. I was betting that exercise returned the best results, but what the study found was far more complex. Unfortunately, the criteria I was most interested in were apparently not part of the study — measurements of hips, waist, chest, upper arms, and thighs.